Panasonic's ErgoFit In-Ear Earbud Headphones are perfect for listening. Enjoy listening comfortably with soft, snug earbuds that conform to your ears. Cord Threads Through Clothing and Bags. Panasonic's ErgoFit In-Ear Earbud Headphones are perfect for listening. Enjoy listening comfortably with soft, snug earbuds that conform to your ears. Wireless Technology Not Applicable Earpiece Type Binaural. Manufacturer Panasonic Connectivity Technology Wired. 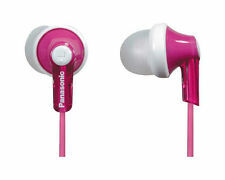 One of the Panasonic Earphones for Music Lovers for your Comfort. - Plug Type Nickel. - Magnet Type Neodymium. - Cord Length (m) 1.1. - Frequency Response (Hz - KHz) 20Hz-20kHz. In-the-ear type Clip Earphones, ideal for sports. Sweat & water resistant design. Enhanced sound quality with large side mount 12.4mm speaker. Limitations and Exclusions Apply (full details will be included with your user manual). 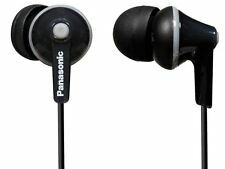 NEW PANASONIC RP HJE120 PPK EARBUDS. Enjoy the ultimate in style, comfort and listening pleasure with the Panasonic RP-HJE120 ErgoFit Earphones. With three included sets of earpads (S/M/L), you’ll get a custom, comfortable fit that won’t slip out. 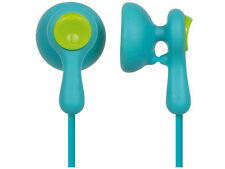 Stereo Earbuds Ergonomic Earphone iPod Mp3. Panasonic Earphones In Ear Headphone. Color-matching for iPod Nano 5th Generation. Impedance (ohm/1kHz) - 16. 96 dB, 20 - 20000 Hz, 16 ohm, 9 mm Color matching for iPod nano 5th generation. Violet Color. 2 neodymium magnets prevent magnetic flux leakage to reproduce powerful bass with minimal distortion;. I don't have any background with headphones, but I know what sounds good and what doesn't. Fantastic bass even at the very bottom of the spectrum. Ergofit Design for Comfort and Fit. 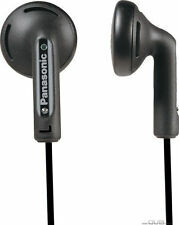 Panasonic ErgoFit In-Ear Earbud Headphones (Black). 9mm neodymium drivers. Panasonic 's blackErgoFit In-Ear Earbud Headphones are perfect for listening to your '80s playlist during those retro Jane Fonda workouts, or just for hopping about town. Enjoy a powerful bass in a compact body with the In-Ear Earphones. They are constructed with a large aluminum housing and high-grade copper cord to minimize distortion. You will hear naturally rich audio with these stylishly designed 360-degree luxe in-ear earbuds. 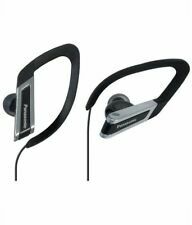 Panasonic RP-HC75-S Noise Canceling Stereo Ear-Bud Headphones with Double Auto Rewinding Cord System. Double auto-rewinding cordsSingle hand operationUp to 54 hours of battery life on 1 AAA alkaline battery Includes AAA battery and airplane adapter. Ergofit Design for Comfort and Fit. 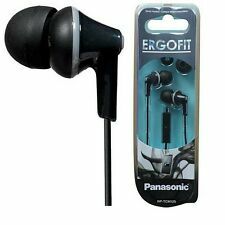 Panasonic ErgoFit In-Ear Earbud Headphones (Black) X 2. 9mm neodymium drivers. Panasonic 's blackErgoFit In-Ear Earbud Headphones are perfect for listening to your '80s playlist during those retro Jane Fonda workouts, or just for hopping about town. 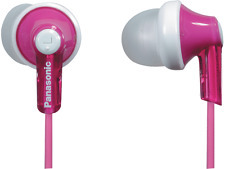 Panasonic RP-HJE120 Stereo ErgoFit Earbud Headphones. Enjoy the ultimate in style, comfort and listening pleasure with the Panasonic RP-HJE120 ErgoFit Earphones. With three included sets of earpads (S/M/L), you’ll get a custom, comfortable fit that won’t slip out. Neodymium rare-earth magnet for rich and powerful sound. Magnetic Type Nd: Neodymium FE: FerriteNd. Cord slider for tangle-free storage. Fequency Response (Hz-kHz)10 - 25. Frequency response 10Hz-25kHz. 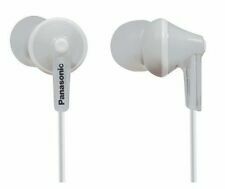 PANASONIC RP-HV096-K Hv096 Earbuds. light weight. Connectivity Technology: Wired. 3.9ft Cord. max Input: 40mw. freq Resp: 20hz-20khz. sensitivity: 104db/mw. Connector Type wired-3.5mm single pin. Microphone Form Factor Without Microphone. Headphones Form Factor Lightweight. Batteries Required No. Batteries Included No. Item Weight 45.4 g.
Panasonic RP-HJE120 In-Ear Only Headphones - Blue. No Mic. 4.5 out of 5 stars - Panasonic RP-HJE120 In-Ear Only Headphones - Blue. No Mic. 90 product ratings90 product ratings - Panasonic RP-HJE120 In-Ear Only Headphones - Blue. No Mic. 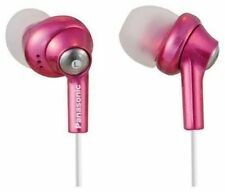 Panasonic ErgoFit In-Ear Earbud Headphones RP-HJE120-D Dynamic Crystal Clear S..
For your consideration is a Panasonic RPHS34M-V Water Resistant Sport Clip Earbud Headphones (Violet) - EUC. Most of my photos are taken in front of a 1" grid to give a better indication of size. ErgoFit Design for Comfort. Cord Slider for Tangle Free Storage. Long Sound Port for Deep Bass. Panasonic RP-HJE125 - Ergofit - earphones - in-ear - blue - Frequency response 10 - 24000 Hz - Manufactured by Panasonic. Panasonic RP-HJE125-A Wired Earphones, Blue. In ear headphone. 10.7 driver unit. 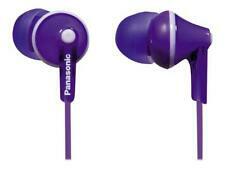 For your consideration is a Panasonic RPHS34M-V Water Resistant Sport Clip Earbud Headphones (Violet) - NEW. Most of my photos are taken in front of a 1" grid to give a better indication of size. Panasonic RP-TCM190 Purpe ErgoFit In-Ear Stereo Earbud Headphones (RP-HJE190-V). Frequency Response：10 Hz - 24 kHz. Model：RP-TCM190. Cable Length (m)：1.2m. Panasonic RP-TCM190-V Fashion Earbud Earphones ErgoFit PLUS RP-TCM190 Purple. Condition is New. Shipped with USPS First Class Package. Powerful sound with neodymium magnet, and cord slider. 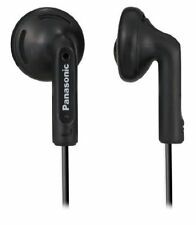 Enjoy full listening comfort with these Panasonic HJE125 Ergo Fit In-Ear Earbuds (Black)! These soft, snug earbuds conform instantly to your ears. Neodymium Magnet. 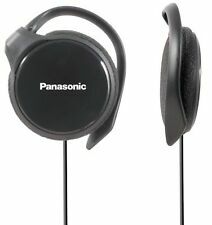 Panasonic RP-HJE125-K Headphones. Tangle free flat wire cord. Music w/out distortion. Built in microphone. Powerful sound with Neodymium magnet. Panasonic RP-HJE280-A Inner Ear Earbuds w/Extension (Blue) (Discontinued by Manufacturer). 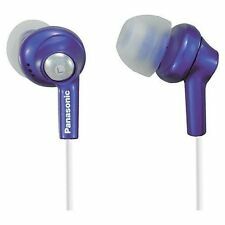 Panasonic RP-HJE280-A Inner Ear Earbuds w/Extension (Blue). 2 feet cord plus 2 feet extension cord. Powerful sound with 9.0mm Neodymium driver unit. The RPTCM360 is made to fit your daily style. Engineered for deep bass with a 9mm driver it supports audio within the 6Hz-24kHz range. The rounded, long earpiece design fits snugly in the ear with the minium of sound leakage. 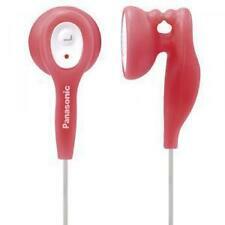 PANASONIC IPX2 EARBUDS. BRAND NEW! Your country is very far from Japan and it takes long till the item reaches you. From my experience it could take 3 to 7 weeks. Design of which the motif the housing & slider flower motifs & transparent feeling the design of flowers ◆.